Hawaiian handmade quilts are considered family treasures and rarely leave a family’s ownership according to a native Hawaiian friend I met years ago when I worked there for the US Navy. Several quilt historians note the Hawaiian quilts we see today date from the 1870s, although religious missionaries introduced the concept of quilting to Hawaii in the 1820s. The Hawaiian quilts from the 1870s used an applique on solid cloth method using two colors: a color for the background, and a color for the applique. Symmetry was very important with these handmade quilts, and the applique was made much like a snowflake cut out of paper. Essentially, the fabric would be cut into its desired shape and then applied to the background fabric. 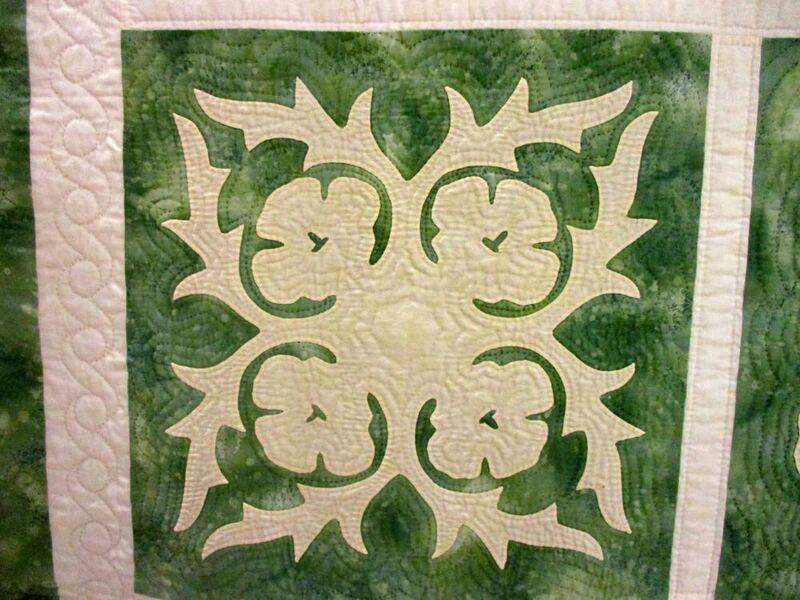 One of the still popular quilt design motifs is to feature Hawaiian flowers, like this Green Hawaiian handmade quilt does. Although I don’t know Hawaiian flowers, it’s easy to see these applique designs are definitely floral. The Hawaiian handmade quilts I saw in Honolulu featured the Hawaiian coat of arms in the center as well as floral and animal patterns. A number of those quilts were red so this mottled green background fabric was an interesting choice to set off the floral applique designs. Just as quilting makes a huge difference in any handmade quilt design, the hand quilting in this Green Hawaiian Handmade Quilt adds a third-dimension. Starting at the border, then in the quilt background and finally through the white applique, the hand-quilting helps to bring the quilt blocks to life. 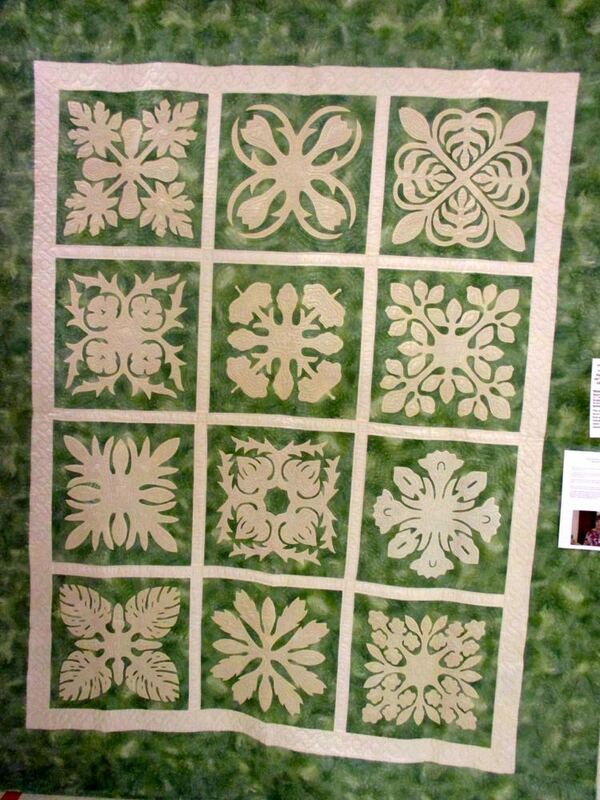 Green Hawaiian Handmade Quilt was among dozens of local handmade quilts entered in the 2017 Piece and Plenty Quilt Guild bi-annual show in Rolla, Missouri. Although it was surprising to find a Hawaiian quilt in the middle of the Midwest, I enjoyed seeing the beautiful detailed applique and quilting. It reminded me of the details and quilting in our Iris Throws, which also represent Midwest flowers. One of my brothers gave me several Hawaiian quilt pattern books several years ago. This one inspires me to dust those off and see if I can tackle making one for myself.